This journal was compiled between 2005 and 2009 on four continents. 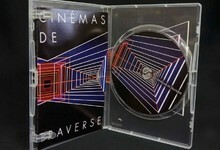 This is a subjective journey through the approaches and experimental procedures to show the magnitude of this research and to honor filmmakers who participate in the history of cinema: Jonas Mekas (USA), Peter Kubelka (Austria), Boris Lehman (Belgium), Joseph Morder (France), Peter Tscherkassky (Austria), Guy Sherwin (UK) among others. These byways lead us to the places of production and distribution networks created specifically for experimental films.